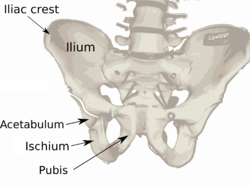 The ilium is a broad flat bone on either side of the pelvis. Joined by the sacrum, the fused bones of the base of the spine, it is fused with the ischium and pubis in a triangular suture at the base of the hip socket. The ilia form the back of the "basin" of the pelvic girdle and anchor the muscles that form the frontal wall of the abdomen.